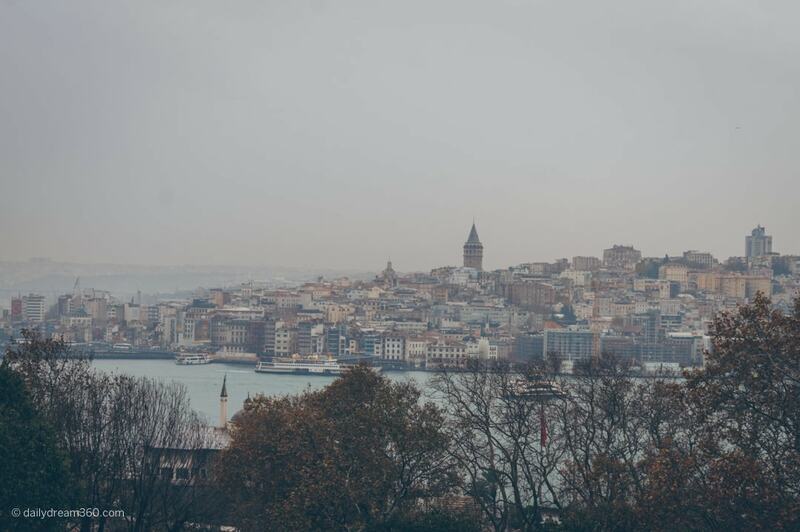 Are you looking for things to do in Istanbul? 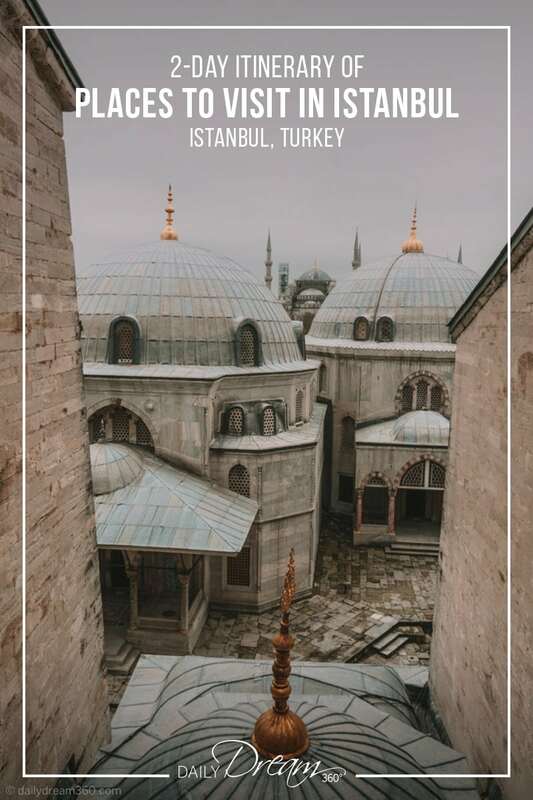 During a recent layover with Turkish Airlines in the city, we took part in a tour which featured many places to visit in Istanbul. 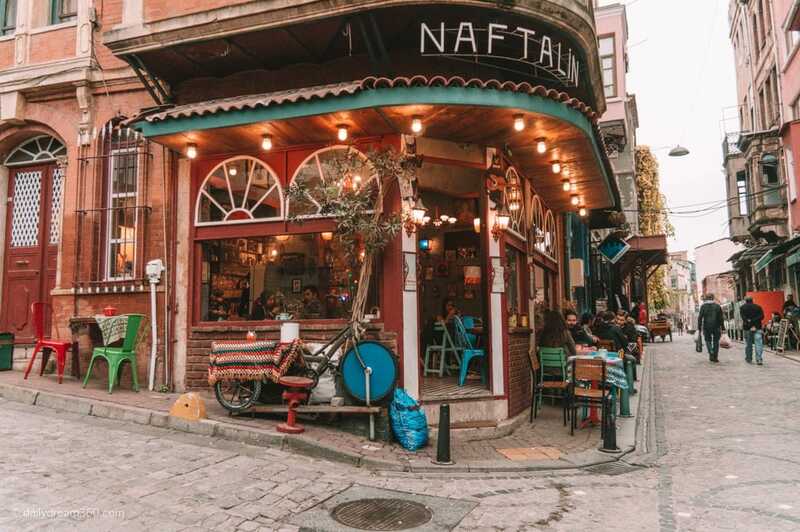 From popular historic attractions like The Blue Mosque and Grand Bazaar on our first day to exploring up-and-coming neighbourhoods like Balat on our second day. 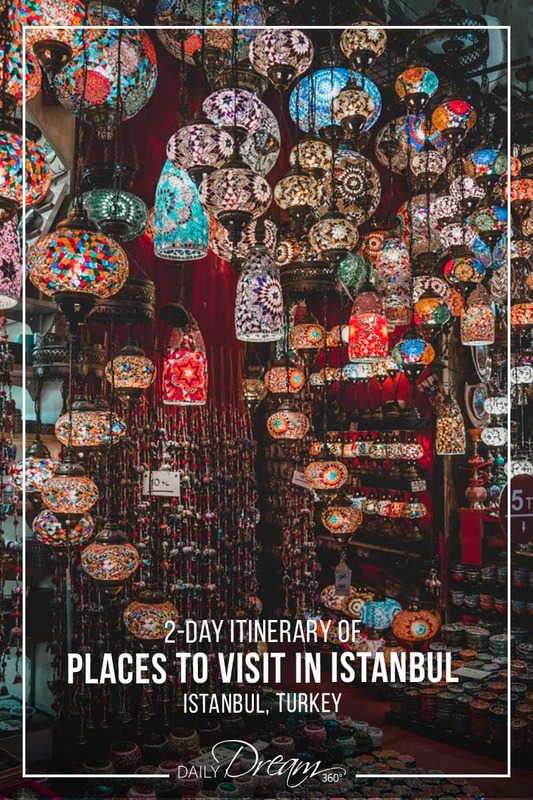 Here is a great 2-day itinerary of what to see in Istanbul. 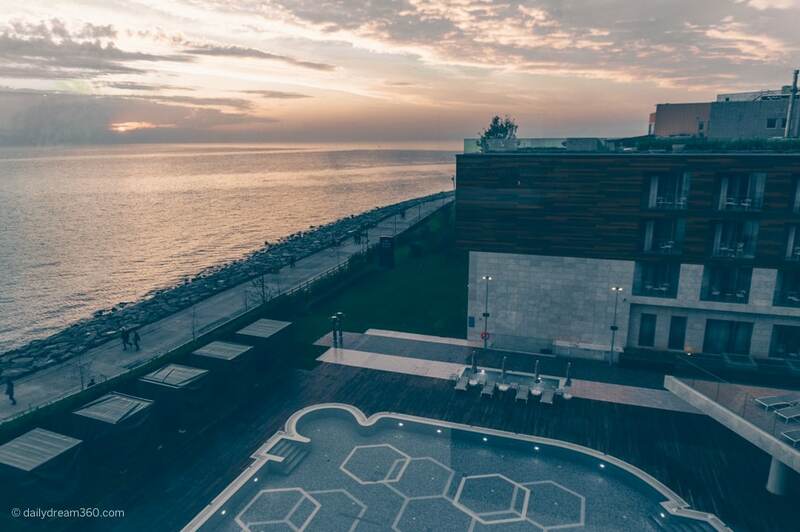 We stayed at the seaside Crowne Plaza in Florya Istanbul. 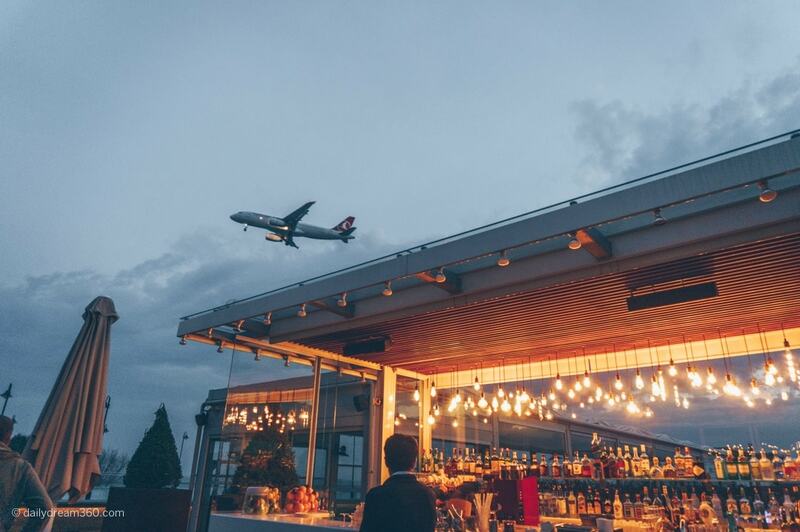 The hotel was located near the old Ataturk Airport as part of Turkish Airlines layover program. 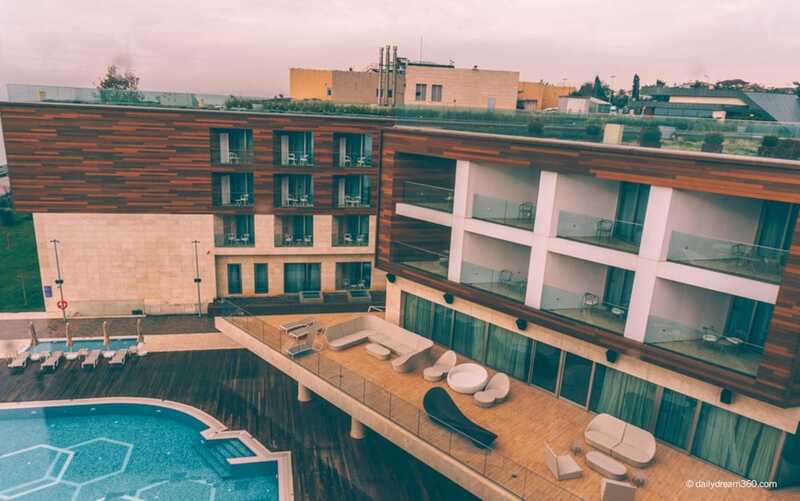 This resort is its own escape with both an indoor and outdoor pool, spa and very comfortable accommodations. The hotel was approximately 30 minutes from Sultanahmet (the old city) even in heavy traffic. For those seeking a seaside escape in Istanbul this area was lovely and had a long boardwalk along the water. 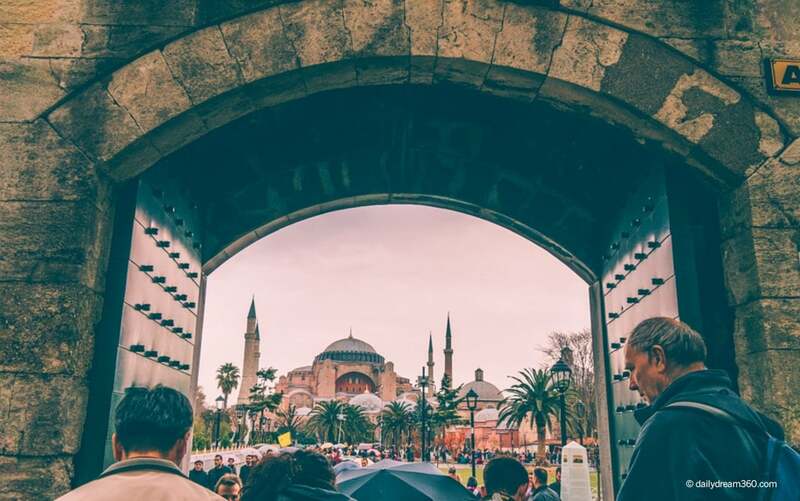 If you only have one day in Istanbul, everyone will recommend a visit to Sultanahmet the city’s historic downtown district. There you will find the most popular Istanbul tourist attractions including the Blue Mosque, Hagai Sophia Museum and the Grand Bazaar. 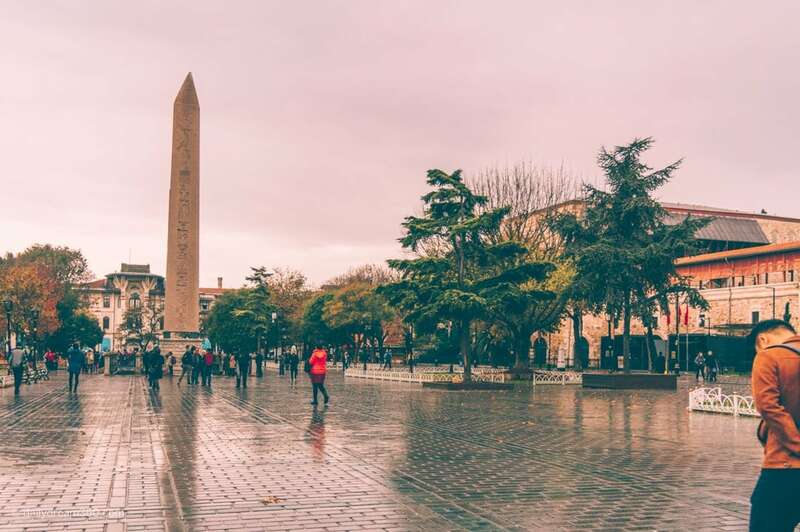 The large square is easy to find as it contains the famous Hippodrome of Constantinople which stands tall in the large open cobblestone square. From this square, you will have easy access to the many attractions in the city. 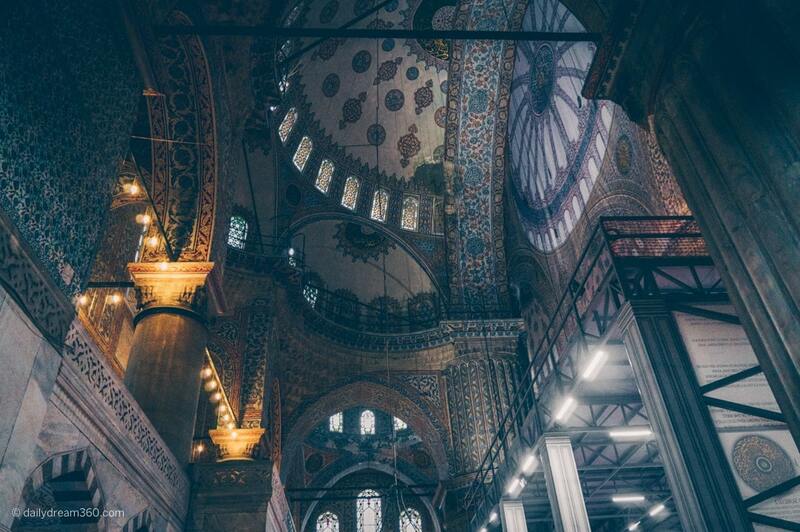 It is important to note that the Blue Mosque is currently under renovation. You will notice the construction both outside the mosque an inside as most of the ceiling is covered with boards and scaffolding. While they did try to add photos of the famous blue tiles, the jaw-dropping effect of walking into the main prayer hall is lost by the renovation. When visiting the mosque is it is important to note that ripped jeans, shorts or short dresses are not acceptable. There are some coverings provided in the form of a long skirt or scarf should the guards not approve of your clothing. For women tight-fitting clothing, and overly exposed skin like low v-neck shirts, ripped at the knee jeans will not be permitted without a cover. A headscarf is also required, and again you will have to pick up a provided scarf if you do not travel with one. I recommend for women visiting Istanbul always carry a scarf that you can cover your head when needed and wear modest clothing vs tank tops and other skin revealing garments. 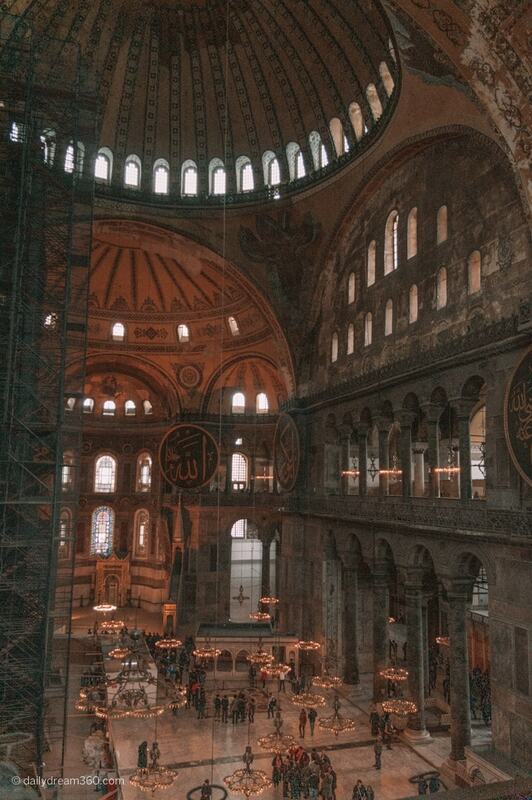 When planning your trip to Istanbul take note that the Hagia Sophia Museum (red Mosque) is closed on Mondays. 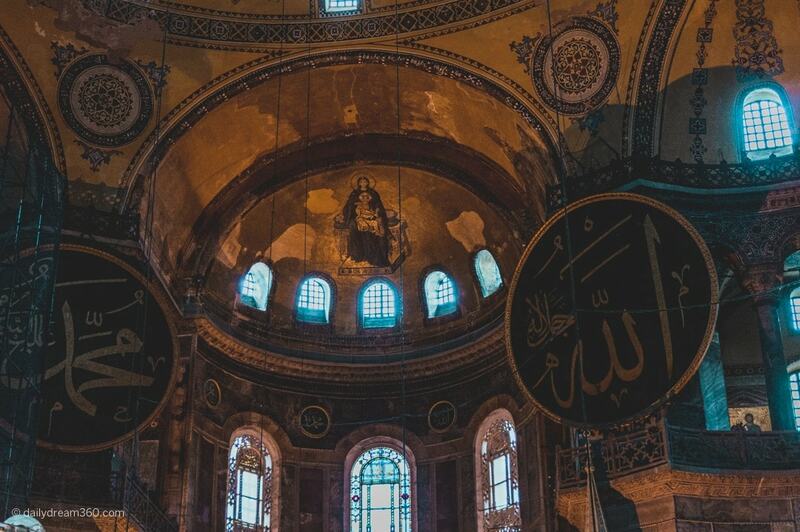 The Hagia Sophia museum is located directly opposite the exit to the Blue Mosque, so I recommend visiting both near the same time. 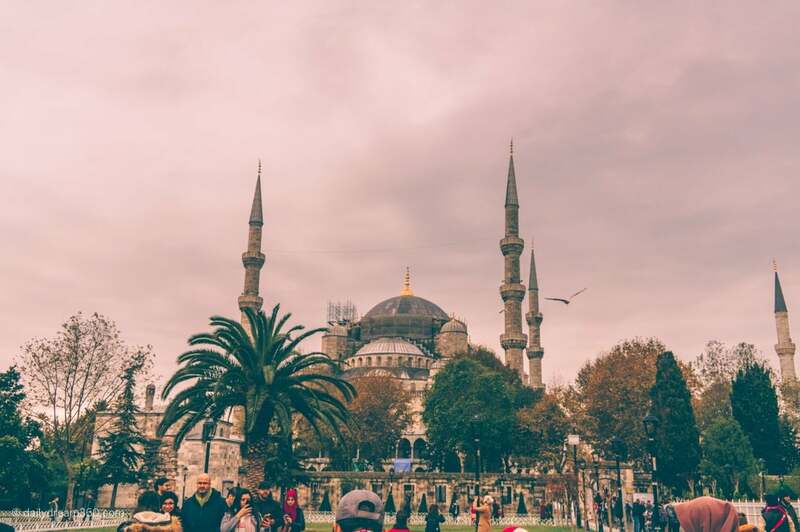 It is crucial that you also plan the trips to these mosques very early in the morning before all the large tour groups arrive to avoid long waits in line. Note that if you have a tripod, it will be taken by security. I had a small Joby Tripod, and every attraction entered I had to leave it behind with security. They give you a tag, and you pick it up on your way out, but I had to remember to pick it up every time, which was annoying. Inside the museum, head to the second-floor balcony area. You will be happy to know the climb up is a pathway and not stairs; it is worth the views of the grand hall from the balcony. Photographers: be sure to keep an eye out for open windows along the outside walls in this area. 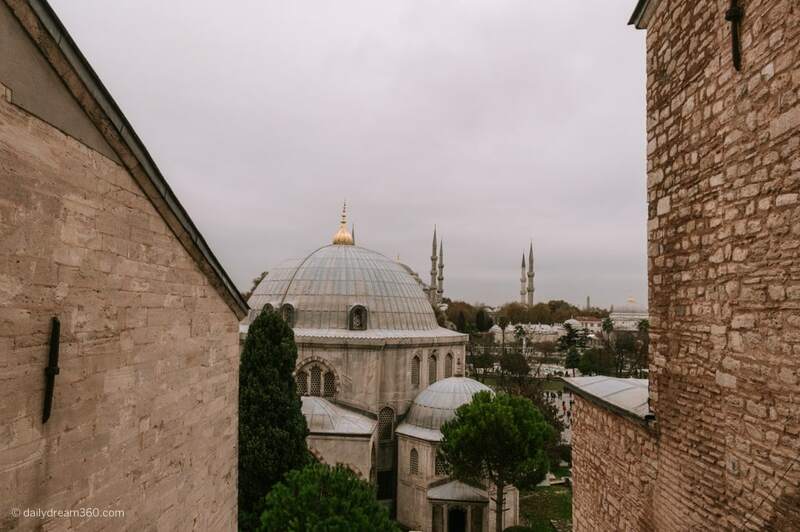 The views include the blue-gray domes of both the Hagia Sophia Museum with the Blue Mosque in the background. The most famous shot is below a vertical view outside one of the windows. I have to be honest we went through the palace a little more quickly as it was a bit of a tourist trap for me. The grounds are beautiful, and even on a rainy day we did enjoy the walkthrough, but some of the artifacts and explanation of things had me shaking my head. The museum is open every day except Tuesdays so plan your schedule accordingly. 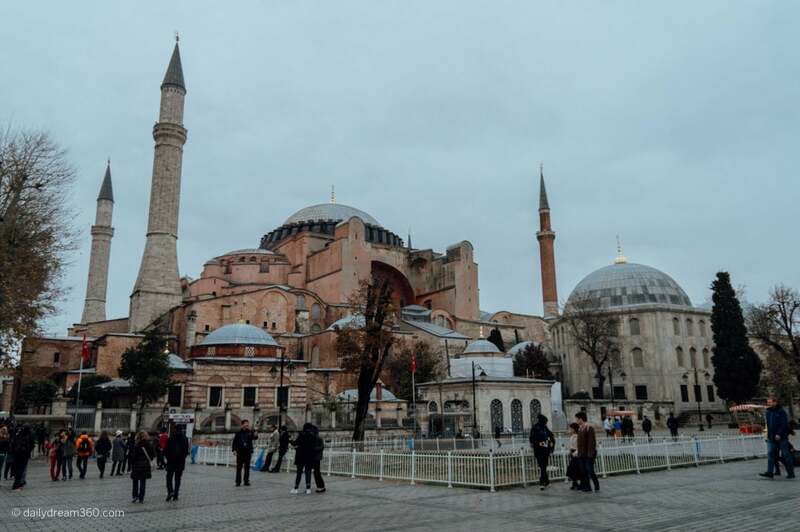 The palace is near the Hagai Sophia Museum. When visiting some of the sacred relic areas inside the museum you will have to dress appropriately, so I suggest avoiding shorts, tank-tops or strapless short dresses when visiting this museum. Inside many of the buildings, we were not allowed to take photographs; however, there were plenty of spots where photos were allowed showing great ceiling tiles, architecture and some gardens. The palace is another attraction where tripods are taken at security, so avoid carrying them in your backpacks. 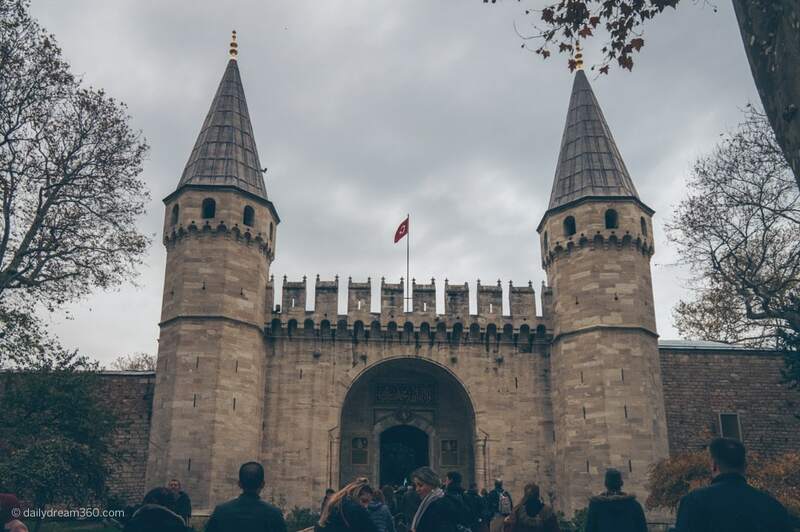 This palace was once inhabited by sultans between the 15th and 19th centuries; you will see colourful tiled rooms, a treasury filled with jewels, an armoury with ancient armour and weapons and many other palace buildings. I recommend finding time to explore the roads around the Sultanahmet square. 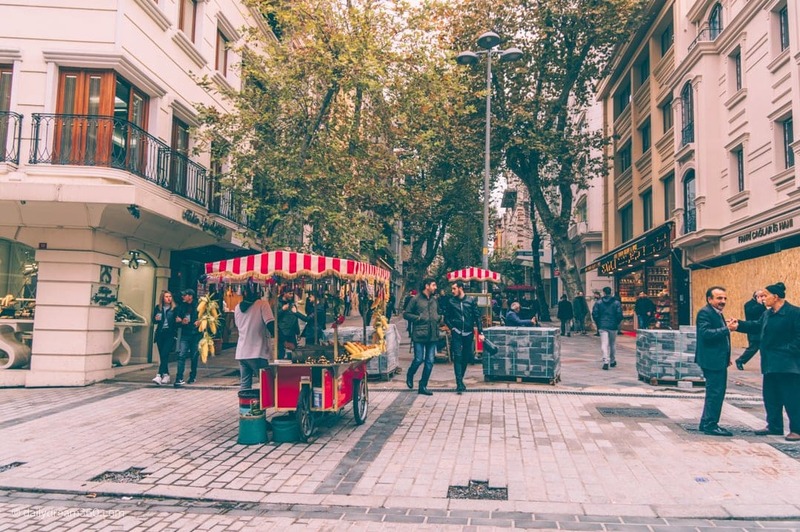 We walked through various areas on route to our restaurant and the Grand Bazaar, but I wished we had more time to explore the many shops we walked by. 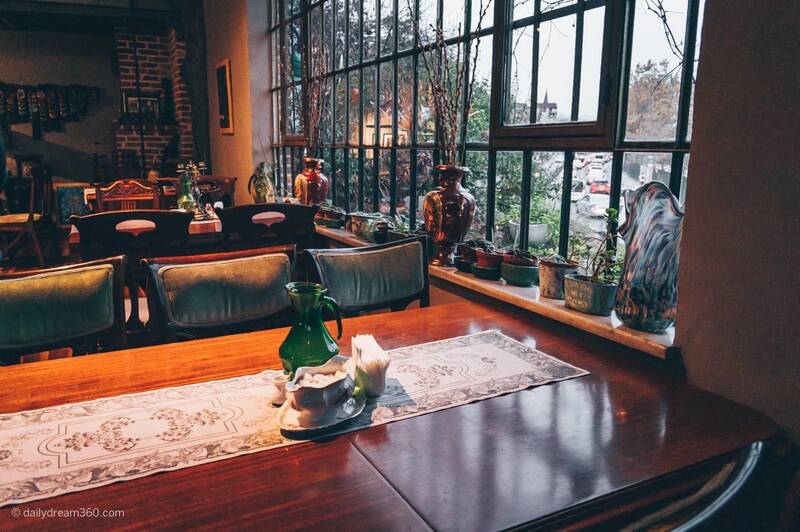 This restaurant is one of those places I will visit every time I’m in Istanbul. Upon walking in, you will see two women dressed in traditional garments making bread. 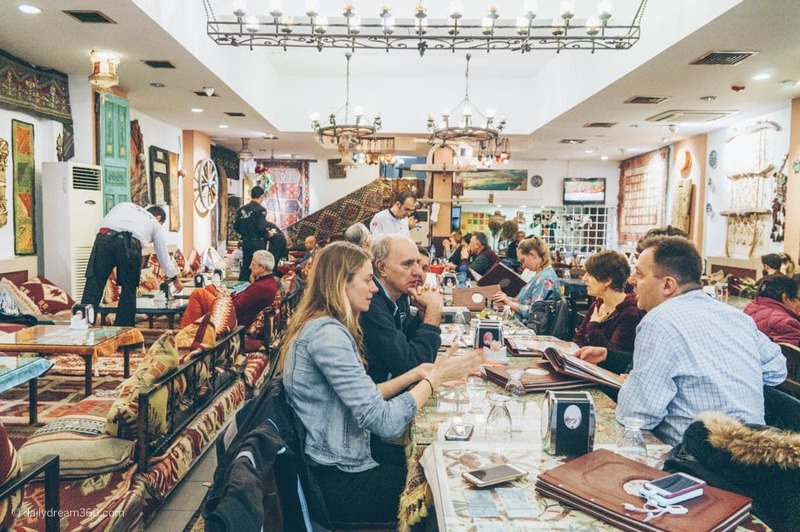 Although this restaurant is in the heart of a touristy area of Sultanahmet, it offers traditional Turkish cuisine in a beautifully decorated restaurant. You can sit at regular tables with chairs or try the floor tables where you sit on cushions and eat closer to the ground. 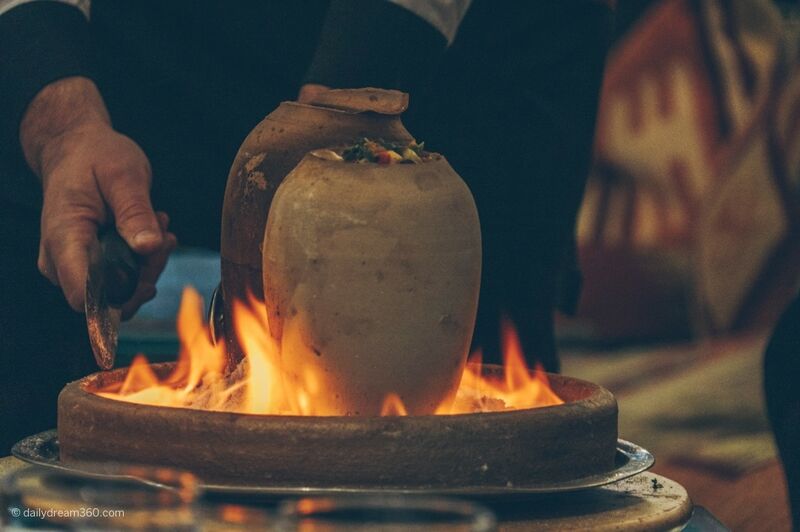 The food we ordered was prepared in clay pots and brought to the table burning in salt. Inside the pots were a meat dish and a vegetable dish which was served over potatoes and rice. 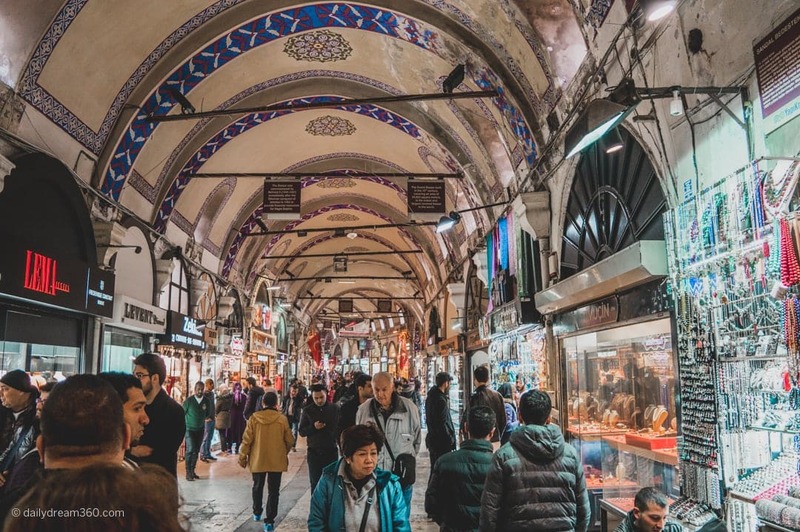 The Grand Bazaar is closed on Sundays so plan your trip accordingly. There are 64 streets inside the market with 22 entrances. It is essential especially if you plan to split up with your group to note exactly where you will be meeting to avoid getting lost. Many of the streets and walkways look the same and are scattered with very similar looking shops. I did not find this market as intimidating as some have written about. I did some research and was all freaked out, but found the Grand Bazaar way more comfortable to navigate than the Egyptian Spice Market which I talk about below. Give yourself time for walking through the bazaar and have an idea of what you are going to buy. I say this because the vendors are crafty at getting you inside their stalls and want to keep you there for a while. If you have a limited window of time for exploring the bazaar I recommend you go in with a bit of a strategy. 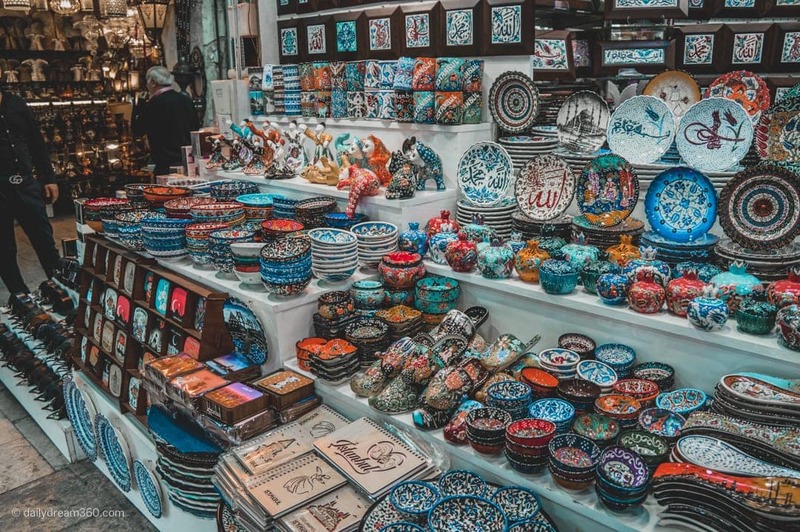 The majority of the stalls offer jewellery, Turkish delight, treats, hand soap, Turkish towels, scarves, souvenirs and handcrafted goods. 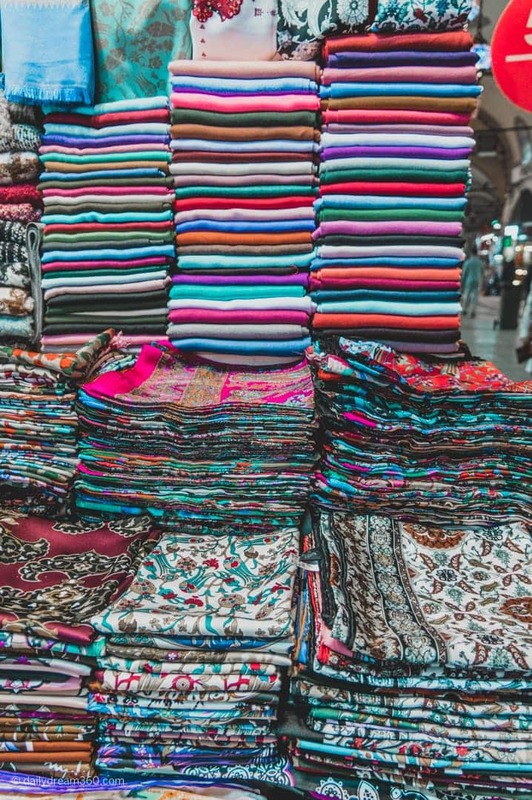 Leather and Gold are excellent quality and there are deals available but leave yourself time to explore shops and find the right shop owners to haggle with. We were fortunate that our tour guide made a great negotiator and pointed us to a few exhibitors he knew to save us time inside the market. Overall I found the vendors at the Grand Bazaar friendlier and easier to negotiate with. At the Grand Bazaar, we only had one rude vendor bark at us when we decided to leave his shop. Some vendors are more aggressive than others, so remember you have the right to walk away. My feeling was if a vendor was being aggressive or rude; I walked away no matter what he was muttering or saying. The vendors who were kind and not pushy seemed more trustworthy and made the experience of shopping at the market more memorable. 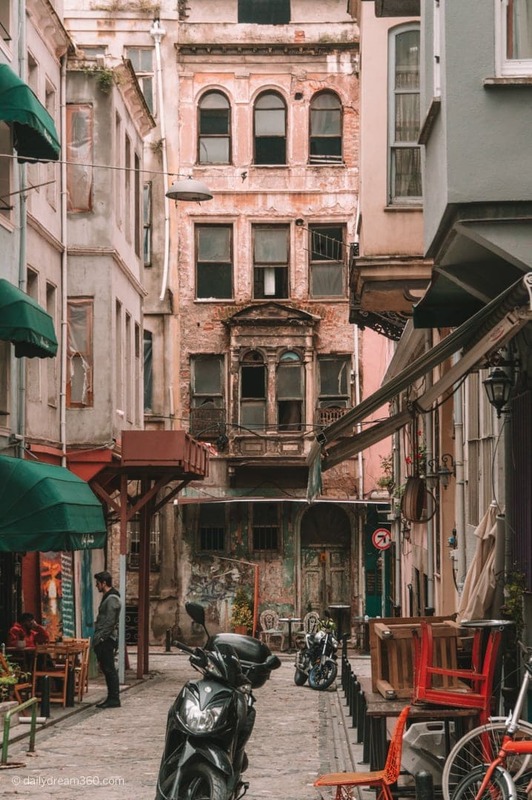 This neighbourhood was once the Jewish Quarter of Istanbul and it still houses synagogues and Greek Orthodox churches. When you first arrive, you will see very old and some rundown buildings are lining the streets. 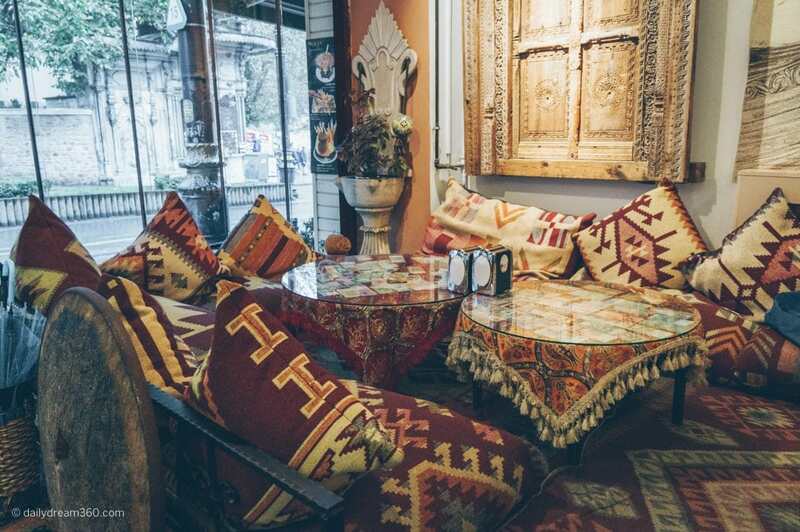 However, you should know that many younger artisans are starting to inhabit the neighbourhood and it is transforming into a trendy, artsy community with cafés, restaurants and galleries. This neighbourhood is quite popular for filming TV and movies so you may run into a film crew during your visit. Also, it may look like these streets are pedestrian only but the narrow streets are open to traffic so stay alert and watch for cars and trucks trying to navigate the tight turns. 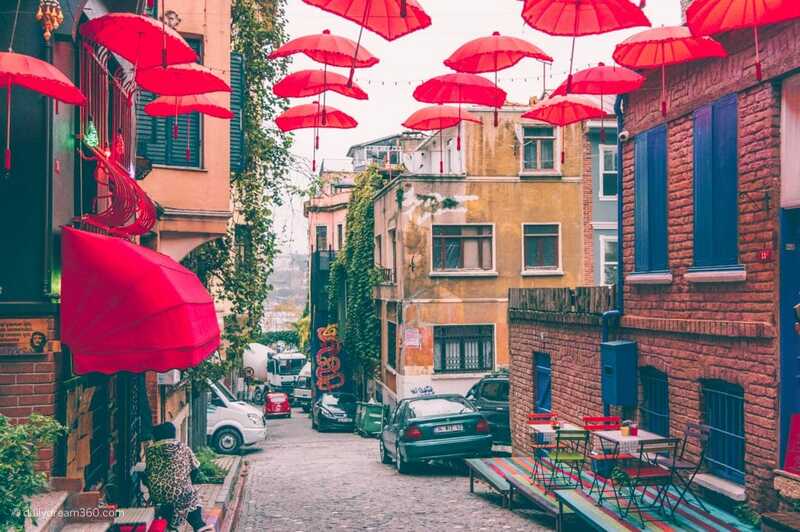 While in Balat I recommend leaving some time to walk around as it is a fun neighbourhood for photography. Many of the streets had colourful umbrellas hanging above and some of the cafes were very funky and interesting to see. 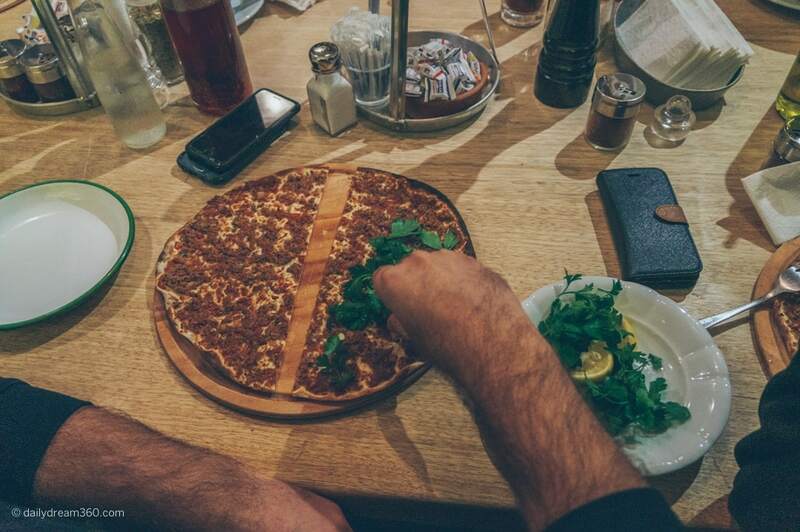 We stopped in at Forno Firin Restaurant for lunch and had yummy traditional pizzas and vibrant salads. 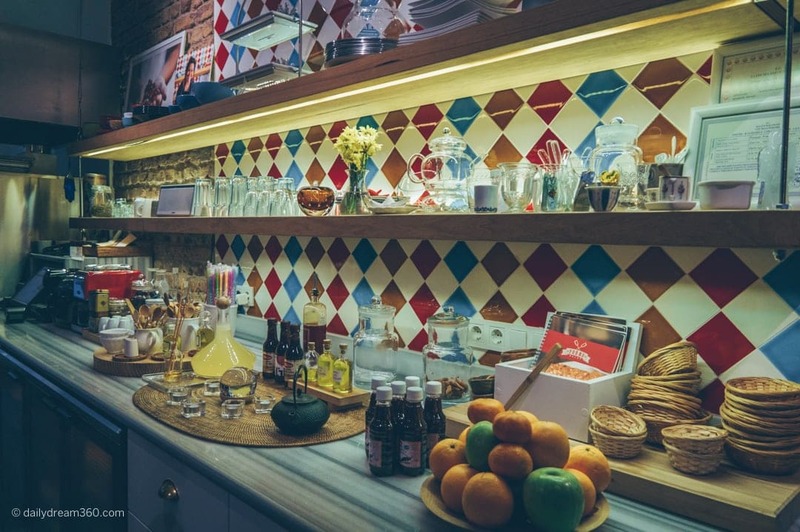 it is a funky little space that makes you feel like you are visiting someone’s kitchen inside their home. There are a few smaller tables and one long table in the middle of the restaurant and these spots were filling up throughout our entire lunch. It is a very popular spot and it is no wonder, the food was delicious. 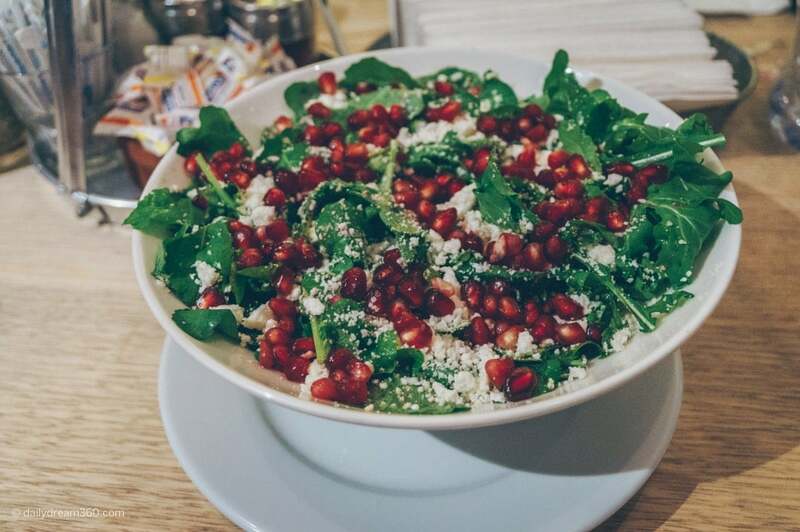 As I’m always looking for healthy places to eat when travelling even though I did enjoy a pizza it was great to share this awesome salad too. I love doing artistic activities when visiting a city because the art then becomes a memorable souvenir. 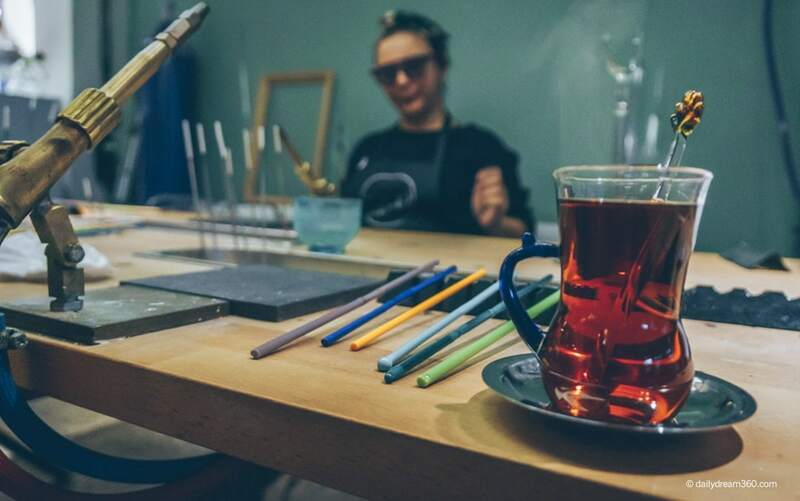 If you are visiting Balat, I recommend a stop at the 1200 Derece Café where you can get a great cup of coffee or tea and participate in a glassmaking workshop. There is also a little store where you can purchase some glass works at the café. 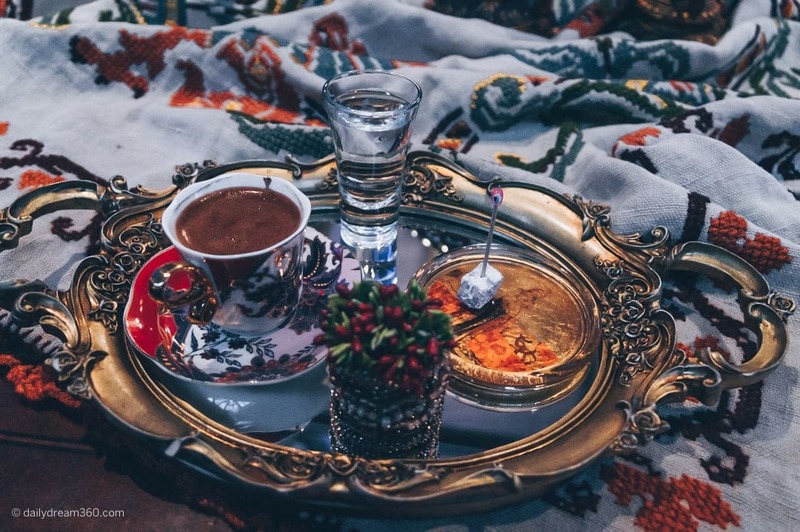 Before leaving the neighbourhood, we decided to stop for a Turkish Coffee. When we first walked into Perispri, I thought it was a furniture store. Inside you’ll find a lot of dining room table sets scattered over two floors. But it is a restaurant serving lunch and dinner and a great place to stop for coffee. I loved the decor at this restaurant and had we not been on such a tight schedule. I know it would have been a great place to stop for dinner. We went to the spice market in the evening after our afternoon in Balat, it is possible this timing affected our experience. 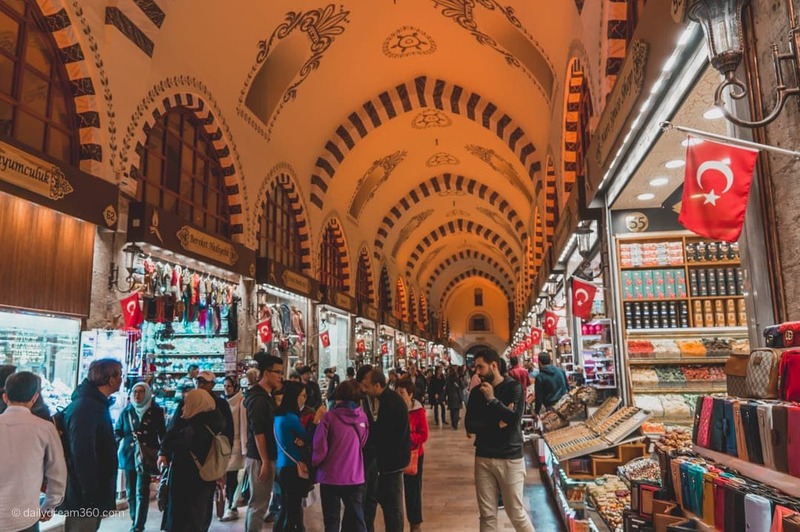 I say this because the vendors in this market were far more offensive and mean than at the Grand Bazaar and this tainted the experience a bit for me. 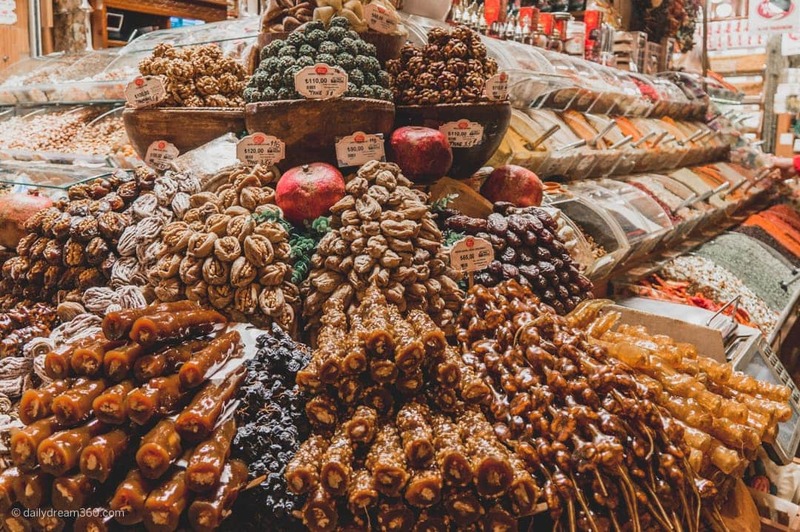 You will find many souvenir shops in the Egyptian Bazaar very similar to the larger Grand Bazaar; however, the focus here is on spices and edibles. As I walked by certain booths, I was yelled at by vendors upset that I didn’t give their stores the time of day. 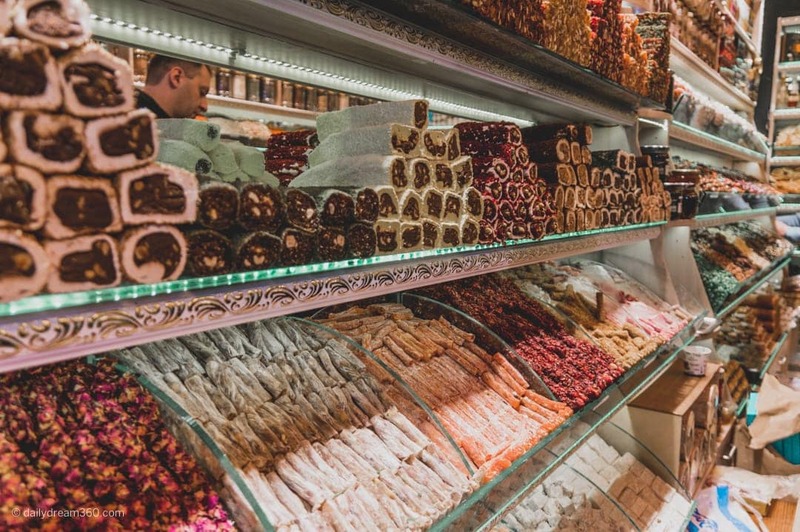 One Turkish delight vendor tried to rip me off and charge me $20 US for a small bag of delights when I spent less than $5 at a vendor in the Grand Bazaar the previous day. So I walked out and he was less than happy with me. 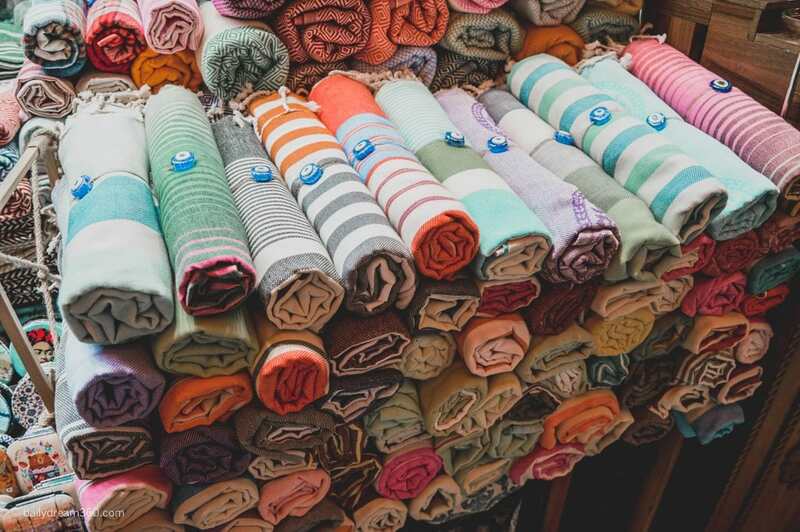 I did manage to buy some Turkish Towels at this market but overall I enjoyed the Grand Bazaar much more. I could not take photos inside the theatre where we watched a Whirling Dervish Show. It was one of those things on my Turkey bucket list that I’ve always wanted to do. A few things to note. These shows are a religious ceremony where live music plays as the participants twirl in circular configurations for an hour. There is no talking and you are supposed to stay seated quietly throughout the performance. Some of the audience members rudely walked out during the show. It can make you sleepy as the music is very relaxing and the twirling can get mesmerizing after a short time. If you are not into spiritual experiences, you may not appreciate this show. Plan attractions using a map and keep locations close together. Traffic in Istanbul is very busy so it is important to plan your stops so that they are closer together. 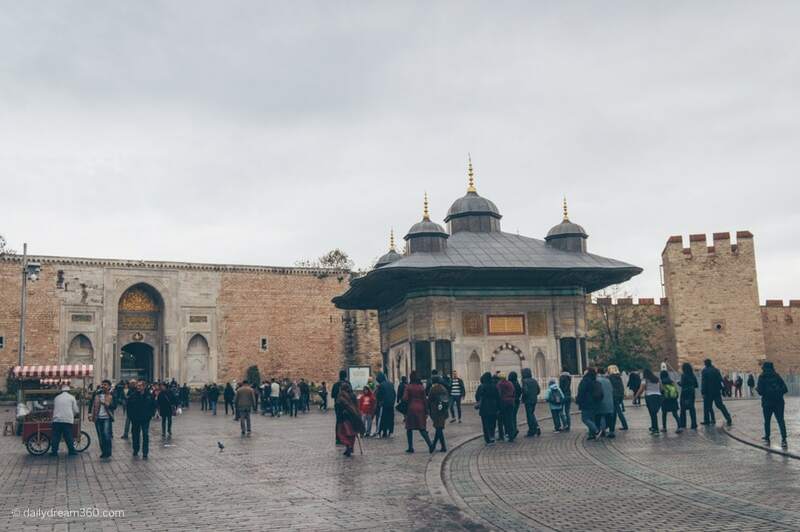 Hitting mosques and popular museums first thing in the morning will help you avoid the crowds and many of these stops are located close to one another. 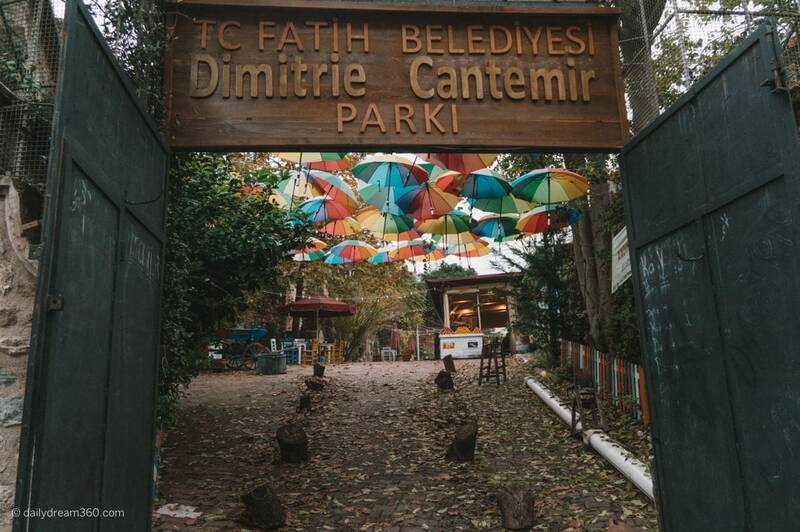 One of the things I was concerned about when I first learned I would be travelling to Turkey was how do I pack for a trip to a conservative country? I’ve decided to create a specific packing list for these types of visits.